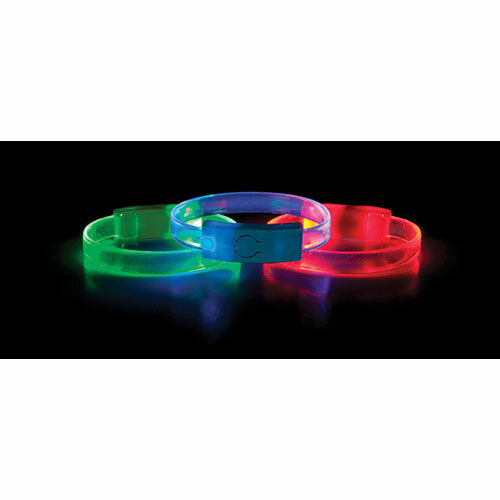 Light it up with these FlashBanz Designz Light Up Bracelets! Kids will love these colorful bracelets with red heart, blue star and green smiley face designs. Each FlashBanz Designz bracelet requires two CR1220 batteries (included) and provides 16 hours of super bright LED light. A button controls light modes of flashing, pulse, constant or turn off. The snap closure allows the lightup bracelet to connect for making necklaces, belts and anklets. Great for parties, July 4th or nighttime safety. 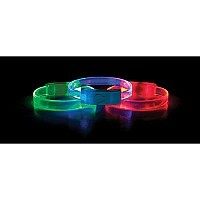 Flash Banz Designz measures approximately 2.75 inches in diameter and approximately 9 inches in circumference. Batteries are replaceable.